Can anyone stop the Williams sisters at Wimbledon? 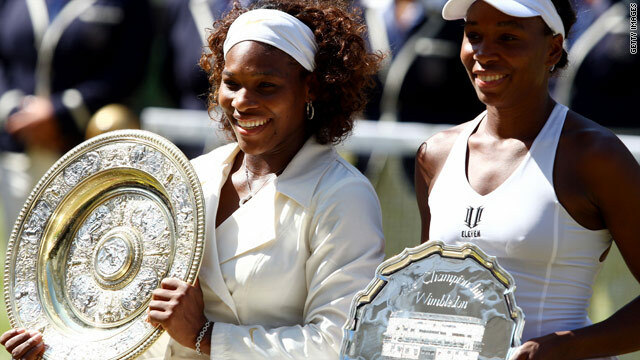 Serena Williams, left,, and her older sister Venus have dominated at Wimbledon in the past decade. (CNN) -- With a record winner's prize of almost $1.5 million, there's a lot at stake for the 128 women tennis players lining up at the hallowed lawns of Wimbledon in the coming fortnight. Last year it was American Serena Williams who lifted the coveted Venus Rosewater Dish for the third time in her career, beating her elder sister Venus in the final and taking home a mere $1.25 million. And it is hard to talk about Wimbledon without mentioning the duo, who over the last decade have dominated play at the All England Club, winning eight of the last 10 titles and playing each other for four of them. Many thought the pair would not play beyond their early twenties, but at 28 and 30 they are still going strong, currently ranked one and two in the world. The top-ranked Serena won her 11th Grand Slam singles title in Australia in January, cementing her place as the world's best player, and Venus added to her title tally by winning at Dubai and Acapulco in February. Serena told CNN that their love of the game keeps them at the top of the rankings. The pair's disappointing runs on clay at the French Open -- Venus lost in the fourth round to Nadia Petrova and Serena in the quarterfinals to eventual runner-up Sam Stosur -- will count for little once they step onto the London grass, their favored surface and where history shows that they can never be counted out. They will also be in with a shot for the doubles title they have won four times before, after also rising to the world number one and two doubles spots. The only woman still playing on the tour to have squeezed her name onto the Wimbledon roll of honor in the last 10 years alongside the Williams sisters is Maria Sharapova, who beat Serena to take the title in 2004. Still only 23 years old, the Russian has been plagued with injury problems over the last couple of years, but has been slowly making her way back up the rankings with a win in Memphis and a runner-up spot at the Wimbledon warm-up event in Birmingham. Despite losing the final of the English grass-court event to China's Li Na -- who must also be considered an outside threat for the big title -- there are signs that Sharapova is returning to the form that saw her become a Grand Slam champion at Wimbledon at the tender age of 17. Wimbledon is the one title that eludes seven-time Grand Slam champion Justine Henin, who will be playing at the south-west London tournament for the first time since returning from an 18-month retirement at the beginning of this year. The former world number one won her 42nd career title at Stuttgart in April and has come back from nowhere to reach 17 in the rankings. However, an early exit to Stosur in the fourth round of the French Open on her favorite clay surface suggests that the 28-year-old is not yet back to her best, and the twice-beaten Wimbledon finalist may have to wait a little longer to be crowned queen on the grass. Compatriot Kim Clijsters also made a return from retirement recently and will be playing her first Wimbledon since 2006. In fact, it was training to play for the unveiling ceremony of Wimbledon's new Center Court roof in May 2009 that the Belgian decided she wanted to return to professional tennis. Clijsters missed out on Roland Garros due to a foot injury but is fully fit and raring to go for the London event. The 27-year-old has never been beyond the semifinal stage, but would dearly love to add the title to her two U.S. Open victories from 2005 and 2009 -- the latter coming in her third tournament back on the tour. The unlikely heroines of the French Open -- Stosur and champion Francesca Schiavone -- cannot be ruled out of doing well at Wimbledon. Previously known as a doubles a player, Australia's Stosur is a Wimbledon doubles champion, having only recently shot to the top-10 of the singles rankings. Her failure to overcome Schiavone in Paris will surely spur her on to win her first Grand Slam singles title, but she might struggle on the fast-paced grass having never progressed beyond the third round before. Schiavone is enjoying her highest ever ranking of sixth in the world after becoming the first Italian woman to lift a Grand Slam singles trophy. Should the French Open leave Roland Garros? She reached the Wimbledon quarterfinals in 2009, proving she can play on grass, but a first-round defeat in the first round of the Eastbourne warm-up event suggests her run to the Paris final may have taken too much out of her. It is hard to see past another Williams-Williams final, with perhaps some disruption from the Belgians, but if the surprises of Roland Garros are anything to go by, Wimbledon could yet see some upsets. Former world number one Ana Ivanovic of Serbia will be a dangerous floater in the draw if she can recapture some of her pre-injury form. Marion Bartoli of France, the losing finalist in 2007, will also be one to look out for, still ranked within the top 20. Serbia's Jelena Jankovic, another former No. 1, will provide the main outside threat from the top-10 along with Denmark's third-ranked Caroline Wozniacki. However, their inconsistent displays at Wimbledon in the past mean it is hard to predict how they will do. British tennis fans will be hoping for much from their number one player Elena Baltacha, who has twice reached the third round of the competition and is now ranked a career-high 55 in the world.